We refer to these states as Calm, Clarity, Fortitude, Embrace, and Sleep. With each one represented by a scented candle, a bath and shower elixir, and a perfume oil rollerball, when exactly would you use each of these, and how? Let’s take a closer look at each aromatic and how it can support your state of mind so that you are able to use the remarkable science of scent to choose how you want to feel. If you’re having a stressful day at work and feel like banging your head against the keyboard, reach for Calm. Apply the perfume oil to your wrists and slightly into the palms before cupping them over your face and breathing deep for the count of five. Soothing and comforting herbal notes will induce serenity and help to settle a whirring mind. With 15 essential oils, including balancing Rosewood, tension-taming Clary Sage and relaxing Lavandin (a species of Lavender known for its particular aromatic properties), this is a handbag essential for whenever life gets too stressful. Is the motivation to complete your presentation eluding you? Perhaps you are undertaking research or are revising for exams? 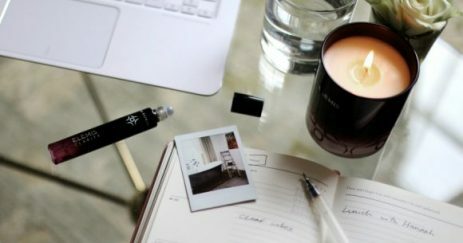 Use this invigorating scented candle to inspire focus and creativity. A refreshing blend of 8 essential oils including citrus notes of energising and stimulating Bitter Orange, aromatic Cardamom and warming Ginger, it sharpens the senses, and clears the mind to help increase concentration levels. Light it at your desk, write a plan of action, then feel an enormous sense of satisfaction as you put a big tick against your to-do list. Nobody likes public speaking. Even those who are brilliant at it can’t claim to be jitter-free when confronting a sea of expectant faces. That’s where Fortitude comes in. Blended with grounding Cedarwood, uplifting Ylang Ylang, and floral Geranium to restore your centre, this is the LIFE ELIXIR that can help boost your confidence. As unusual as it may sound, try taking a morning bath to ease yourself into the day. Your skin will be beautifully fragranced and soft and you will feel empowered and determined. Get ready for your standing ovation. This formulation is sensual and warm. Try lighting an Embrace candle at the end of the day and practising some nurturing and restorative yoga poses. This is not about being in a competitive class and showing off your headstand skills, this is about you falling into the flow of yoga at your own pace, meditating on a positive sense of self, accepting and loving who you are. Stay in child pose or pigeon pose while the scents of seductive Vetiver, earthy Frankincense, and potent, spicy Rose Pepper mingle around you, encouraging inner harmony. Unfortunately, insomnia is no stranger to the majority of us. So restore body and mind with this deeply relaxing blend to encourage deep sleep. Formulated with 13 pure essential oils including sweet and tranquil Patchouli, unwinding Elemi and soothing Palmarosa, the Sleep Bath & Shower Elixir is the perfect support to help alleviate sleeplessness. Proven to leave you feeling well rested*, you can put your head on the pillow after a bath laced with this fragrant oil and welcome a night of peaceful slumber.